The collection is bound into a single volume approximately 9¾” x 11⅝” (248 x 298 mm) containing 112 pages, some of which have no content. The title of the volume is embossed on a leather panel on the front cover. printed music bound or pasted into the volume, including seven sheets not bound in but loosely inserted into the volume. 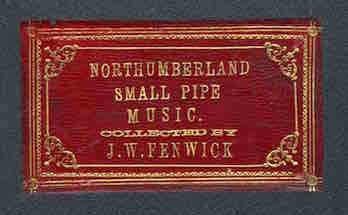 The organisation of the collection appears to suggest that James Fenwick was preparing tutorial material at least two decades before the publications of the 1896 Instruction Book published by the Northumbrian Small Pipes Society. As part of this work he appears to have amassed and collated tunes from early sources, doing so through contacts with pipers who had their own roots in early 19thC piping. Analysing and interpreting the contents of the collection will require much work by people with a range of skills and experience. Whilst the most immediately interesting content might appear to be the manuscript music, aspects such as the provenance of the music and details given in other elements of the collection also provide important avenues for research. 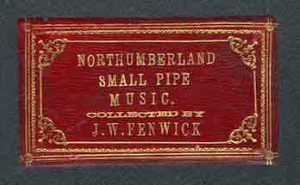 These include insights into the network of pipers and other musicians in North Shields and the surrounding area, and into social and vernacular music in North Shields during the early 19thC. Further, initial research into the contents of the collection reveals hitherto unsuspected links to North Shields and Tynemouth which support their significance as a centre of piping.